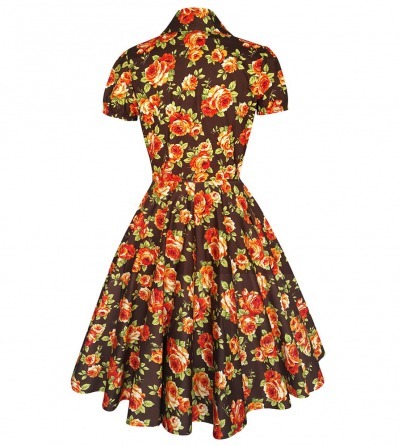 Swing into summer fun with this vintage inspired tea dress. This summer dress caps at the shoulders, framed buttons around the bust, and sports a jeweled collar to give off that perfect, vintage inspired look. 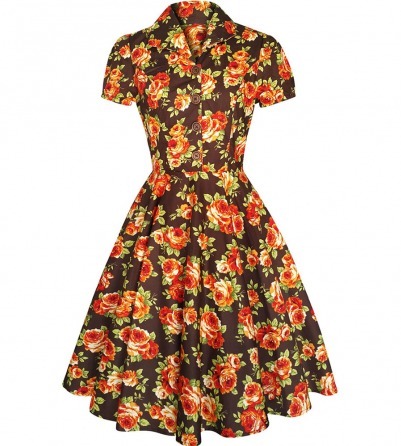 With its brown backsplash of beautiful floral roses, this classic tea dress flows down into a wide flared, full circle skirt that gives it the perfect vintage feel. The premium cotton fabric makes this dress lightweight and perfect for your next tea party!